Bursting with information and often incredibly beautiful - maps do more than just showing you where you are, or where you might be going. Here we tell the stories behind some fascinating examples. The recently published Times History of the World in Maps features documents from ancient civilisations, through the medieval period, to some of the key events of the 20th Century. Historian Philip Parker helped compile the accompanying text. 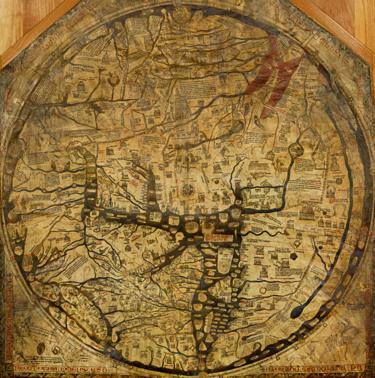 This fine example of Christian cartography below is the Mappa Mundi at Hereford Cathedral. 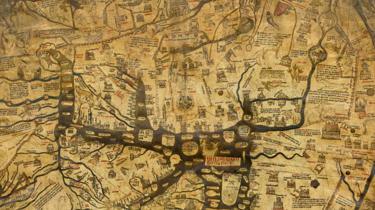 A treasure of the medieval world, it records how 13th Century scholars interpreted the world in spiritual as well as geographical terms. 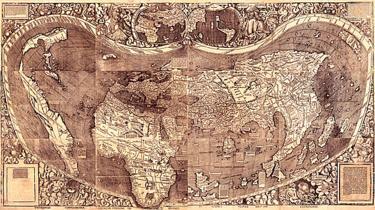 The world depicted is centred on Jerusalem. The single sheet of vellum features about 500 drawings - including cities and towns, events, plants and animals, plus strange mythical beasts. 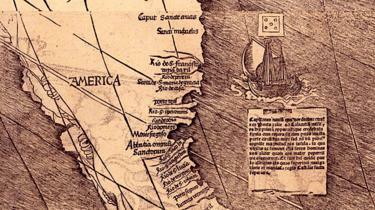 The next image shows the first time that the name 'America' was used on a map as a term for the New World. Named after Italian explorer Amerigo Vespucci, the continent features on a section of modern day South America, from the 1507 Waldseemuller World Map, which originated from Germany. The Battle of Gettysburg, in 1863, is widely considered the turning point of the US Civil War. 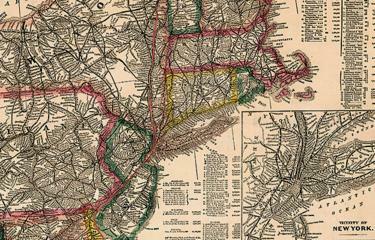 This map shows how Confederate and Union forces squared up against each other around the Pennsylvanian town. 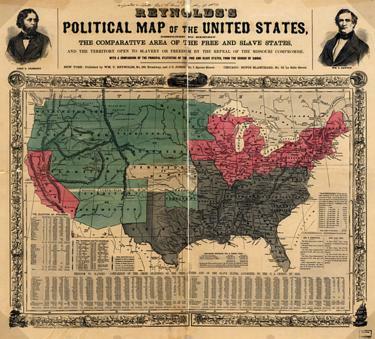 The map was drawn relatively soon after the battle by a Union Army supporter - a northerner. That's why Confederate forces on it are termed 'rebels'. 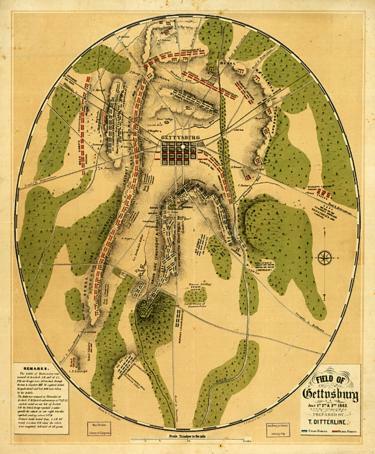 The shaded topography, showing ridges in the landscape, was included to help the public envisage how the battle played out. George Bradshaw's popular railway timetable guides, which were revised and republished long after his death, are what he is best known for. 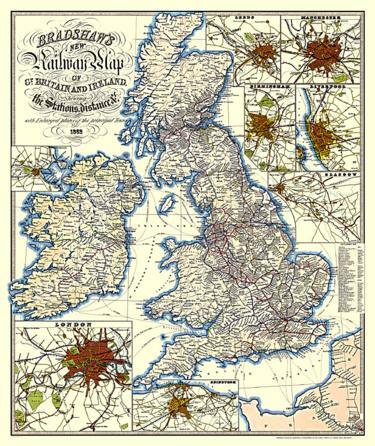 But he was also a cartographer - and his map from 1852 reveals a dense network of railways lines spreading out across much of the UK. Considering that passenger rail services were a relatively recent phenomenon, the explosion of branch and main lines - over a period of about 20 years - is remarkable. The densest parts of the network are where industrialisation was happening fastest. Central Scotland, the north of England from Liverpool to Hull, and the Midlands. There were fewer trains in southwest England and south Wales. 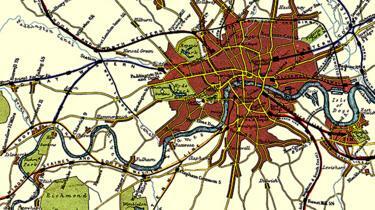 The close up city maps reveal just how much industrialisation and urbanisation was still to happen in the 19th Century. Industrialisation was also a driving force for railway development in other countries. 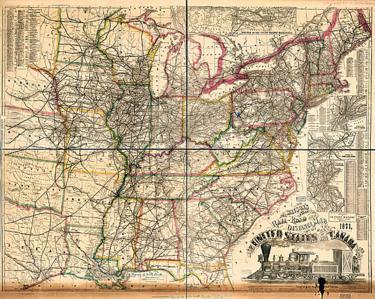 This Gaylord Watson railroad map of the United States dates from the early 1870s. From the northeastern seaboard, the rails have spread west - stretching to areas which hadn't been part of the USA for that long. The black ink hand-written annotation is what makes this relatively ordinary map of Cuba special. President John F Kennedy was shown the map at a CIA briefing in 1962 - and it was he who marked where the Soviets had started to construct nuclear missile launch sites. 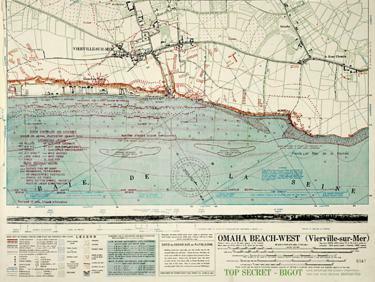 The map is a testament to the Cuban Missile Crisis - playing a physical role in the tension and drama, which saw the world brought to the brink of nuclear war. 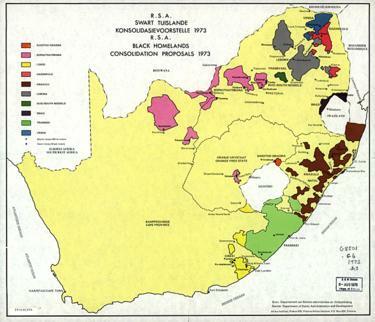 The coloured shapes on this map from 1973 show the South African government's black homelands consolidation proposals. Under the apartheid regime, the homelands - or Bantustans - were designed to be separate political entities. Black inhabitants of these areas were deprived of their South African citizenship. These mini states - never internationally recognised - were spread out, deliberately fragmented. 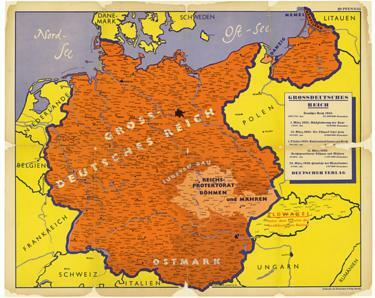 And if you have not watched it yet - click on the video at the top of the article to hear how this map was used by Nazi Germany. And how this one helped the Allies at D-Day. 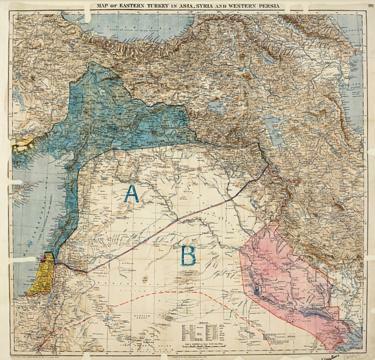 Why this proposal to split the Middle East in two never happened. Why this map of the USA was used as a warning. 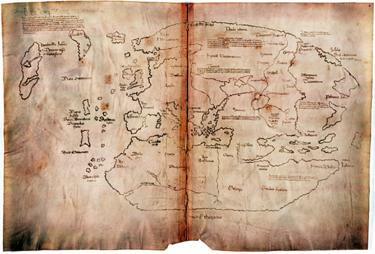 And why this map was not quite what it seemed.